I don’t know about you, but when I think about reflexes I think about the doctor hitting my knee with a mallet which resulted in kicking my leg out straight. When looking at our kids though, reflexes play a much more important role than just kicking our legs. 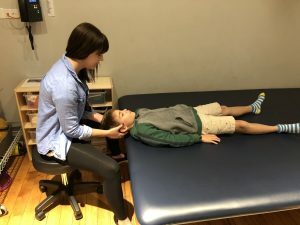 The Moro Reflex, Asymmetrical Tonic Neck Reflex (ATNR), Symmetrical Tonic Neck Reflex (STNR), and the Tonic Labyrinthine Reflex (TLR) are a few of the primitive reflexes that occupational therapists assess to identify if they may be an underlying cause of concern. Each reflex is responsible for different areas of development and when not integrated can lead to a variety of issues. The Moro Reflex, also known as the startle reflex, helps us to understand our world and increases our sense of safety within our environment. This reflex appears at birth and should be integrated between 2-4 months of age. If this reflex is not integrated it can lead to any of the following issues; hypersensitivity to changes within their environment, increased startle response, anxiety, poor social skills, poor impulse control, decreased frustration tolerance, fatigue when over stimulated, and motion sickness. 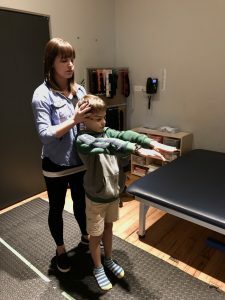 The ATNR defines sagittal midline which allows for the child’s head to turn side-to-side without body/arm movements which helps facilitate rolling. It also influences eye-hand coordination, horizontal eye pursuits, increases core strength, and stimulates sensory systems (visual, tactile, and proprioception). The ATNR appears at birth and should be integrated by 6 months of age. 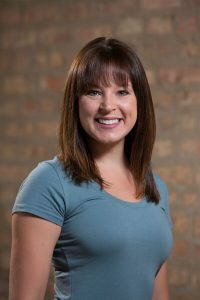 A child who has an unintegrated ATNR could demonstrate decreased balance, bilateral coordination and hand dominance, difficulty crossing midline, poor handwriting skills, and decreased hand-eye coordination skills. 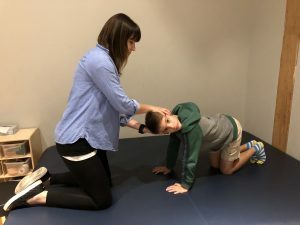 The STNR is the precursor to crawling, helps with the disassociation of the upper and lower body, assists with the visual accommodation (focus between near and far), and helps with the development of muscle tone and posture control of the neck and upper back. This reflex appears between 6-9 months and should be integrated between 9-11 months. A child with a non-integrated STNR doesn’t crawl, has a tendency to be a “W” sitter, and could present with decreased postural control, decreased bilateral coordination skills, poor visual accommodation skills, and decreased attention and focus to tasks. The TLR is responsible for a child knowing where their head is in space and being able to separate it from their body. It helps a child develop balanced muscle tone and gradation of movements. The TLR appears in utero and should be integrated by 3 and a half years of age. If it is not integrated it could lead to decreased body awareness, poor postural control, low muscle tone, poor ocular motor control, and difficulty with coordination, timing, and sequencing. If a child’s reflexes are not fully integrated they may never be, and with changes in their lives the affects that the non-integrated reflex has on their skills will change. A child can complete different activities to help integrate reflexes and can learn different compensatory strategies to increase their overall success and independence within completion of activities of daily living. For more information please reach out to your occupational therapist.